Shelly's first recollection regarding music was when he saw a marching band come down the street when he was 8 years old. The gleaming trumpets and their sound made an impression on him, enough that Shelly remembers it today. The next recollection is when his family moved when Shelly was 10, and his new school district offered instrumental music. He was very excited to start on trumpet, later changing to Baritone and Trombone. 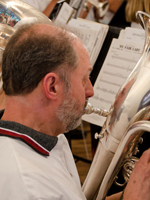 Through the years, Shelly has been fortunate to have played with quite a variety of groups, including German Oom-Pah bands he (still has his lederhosen), symphonies, big bands, musicals and, of course, The Little London Winds. My favorite composers fall into two categories...old and new, or classic and contemporary. In the classic genre, it's Tchaikovsky. For contemporary, it's Leonard Bernstein. Shelly finds his music is beautiful and complex...beautifully complex.